There are numerous debates about the relative importance of industries in the Dakotas, as there should be. The constant re-examination of the relative position of industries means people are paying attention. In the last several years the main focus of the debate was the relative supremacy of agriculture versus oil. That debate is on the back burner for now, somewhat, with most commodities in something of a down cycle. I thought we could look at the performance of other industries right now to see what they are doing. There will be several of these smaller posts to focus on that. Today I thought I would look at manufacturing. This is one I constantly hear discussed in economic development circles. There is a desire to bring in manufacturing jobs as part of an expansion of the local economic base. We can debate the ability of these efforts to succeed at a later time, because I think it is surely in question. 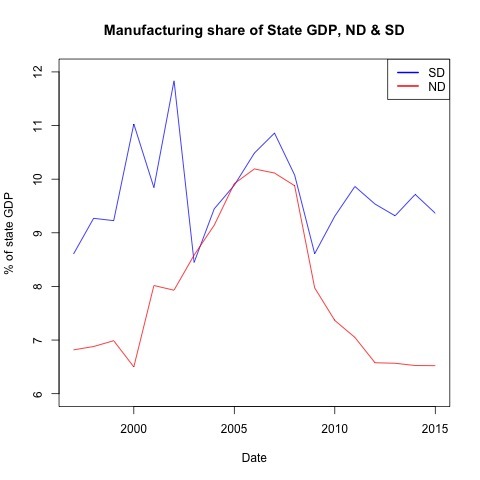 What I found interesting in this graph was the fact that South Dakota has such a consistently higher share of GDP from manufacturing activities. For North Dakota (the red line) as oil expanded manufacturing became less important. While it was up and down, the industry did expand though it became a smaller share of GDP. So essentially oil did not create opportunities in manufacturing. While this is not necessarily incredibly surprising, I think it should be investigated further. In particular I am curious if the labor constraint created by the rapid rise in oil provided little ability for growth that was perhaps less closely tied to the oil industry. Commodity or resource based booms are an interesting creature, and the recent experience of North Dakota could be an important addition to the data and policy about these booms.